I'll be the first to admit it - that gorgeous cover ensnared me. Yet, the enigmatic synopsis is equally - if not more - interesting. Ironskin seems to be a futuristic, paranormal, and almost gothic mystery. Not only does it have elements of Jane Eyre visible in its romance, it also contains rich world-building in a new realm. Furthermore, I am very much intrigued by the romantic setting of this story and am thrilled that the characters in this tale are adults and not teens as that gives scope for a more well-developed love story. In addition, that iron mask on the cover is not only eye-catching (not to mention the dress and the mist and the ominously bare branches and the silhouette of a mansion in the background and the dark steps and gosh that beautiful slipper! ), but I am also intrigued to learn more about it. 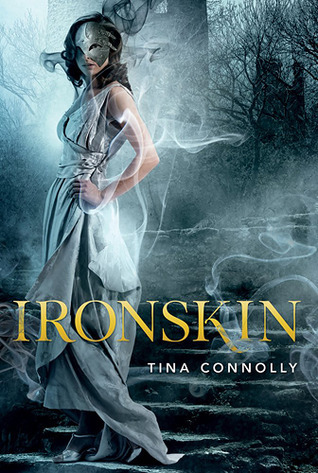 I tend to love novels with faeries in it - not the Tinker Bell kind, but the evil kind who are apt to curse you - and Ironskin seems to perfectly fit the bill. This is a novel that has paranormal creatures, futuristic technology, and an old-age love story - all qualities that are making the wait for this book pure hell. Plus, that cover will look amazing on my bookshelf! ;) What are you waiting on this week? The cover definitely caught my eye when I first saw it! Very pretty, and I love that smoke coming off of her dress. I love the synopsis as well! I haven't read too many fae book, so I'm really excited to read about this evil fae and this curse. I'm really excited for this one! Have to add my voice to the ones who were ensnared by the cover first, and the synopsis second =) I can't wait to read it! Curse of the awesome front cover strikes again! I can feel all the money flying out of my purse already with all the books I just have to get, this one included! The cover is gorgeous and the summary sounds very interesting. I hope you like it when it comes out. I'm definitely looking forward to Ironskin as well. The cover is definitely appealing. Great pick! I'm dying to read this book! I think this sounds really good and so do the characters. Also I love the cover, it is so gorgeous! Like you, I just can't resist a pretty cover, not ever. The summary is pretty interesting too, so hopefully this won't be just another disappointment. Fantastic pick, Keertena. I'm just about to start this one. Did you get it off NetGalley too? I absolutely adore the cover, it looks really awesome. Fingers crossed the book will live up too!